The questline for the legendary starts out with you having to get to honored with http://mop.wowhead.com/faction=1359. You reach honored with him by killing Mogu and Mantid in Townlong steppes and the Dread Wastes. After you reach honored with The Black Prince you can go to Teng Firebrew and he'll give you Stranger in a Strange Land to start the legendary questline.The sigils for this quest are going to drop from all MoP raid bosses, such as Sha of Fear. once you have 10 of the sigils of wisdom and power, you can go back and get the next quest from Wrathion (the guy that starts the questline) for the questline. I assume that the next quest in the questline is Fear Itself, in which you'll have to kill the Sha of Fear. ( i still dont know if the legendary gems are going to replace the breath, but ill know when it comes out) One of the legendarys you get from this questline are 1 of 3 gems that can be placed in Hydraulic sockets, that only raid weapons have, such as Shin'ka, Execution of Dominion, this is the quest which rewards you with the gems:Breath of the Black Prince, or ( i dont know if the gems replaced this or not yet)Breath of the Black Prince, an item that lets you turn a piece of Sha-touched equipment ( weapons from raids, you'll know if its sha-touched because at the bottom of the gear stats it'll say "sha-touched) into an 513 ilvl legendary weapon, like say you have Shin'ka, Execution of Dominion, it would turn that into a legendary two-handed axe. My question is, do these items drop without the quest in your log? I am thinking they probably do, I certainly hope so - we have so many dailies and what not in our logs I am trying to have as few quests as possible. So if I can get the sigils without the quest, that'd make me happy. Interesting to find a Black Dragon again. I wonder if we are getting all the story. Quite frankly I don't trust much of what he says after personally meeting his father. _He_ needs to gain rep with _me_! What's the drop rate of these? I killed first boss in Mogu'shan Vaults and they didn't drop. Confirmed that these do drop in LFR on live. Just received one for each boss. As soon as any class dings 90, they'll receive an in-game mail from Wrathion telling them to visit him in The Tavern in the Mists. Once you get there you'll get a small RP quest with a cutscene. At that point you'll be presented with two quests, the one on this page and Trial of the Black Prince (all you have to do is get honored with him). Rep with The Black Prince can be gained through killing mobs that you will be killing for dailies, and can therefore be more or less easily ground through to Honored. There are also locations to farm in various zones. Took me less than 30 minutes to get 3000 rep. These two quests are the start of the legendary quest line available to every class in MoP. The rep is easy enough to get, but this quest requires you to kill raid bosses for sigils. If a boss drops a sigil, everyone on the quest will be able to loot one for themselves. Sigils of Power are dropped by raid bosses in Mogu'shan Vaults, and are lootable with one for each person in the raid currently on the quest. LFR bosses have a chance to drop them, and they will be put into your bags just like normal loot, as well as normal and heroic modes dropping them as normal drops with everyone being able to loot one. Sigils of Wisdom are dropped by other raid bosses in Vault of Fear / Terrace of Endless Spring. Does anyone know if the Sigils are linked to the loot table? I understand that they are random drop chance but is it possible to keep running LFR and getting a chance to drop or there is just one chance per boss per week? Yes, you have to be on this quest to get the Sigils from LFR/Normal/Heroic raid bosses. I didn't have the quest when I did some LFR and no Sigils ever dropped. 5 minutes ago, I got this quest and now they have a chance to drop for me! LFR resets for me tomorrow so I'll come back here and repost! from what i read, apparently after this quest there is another quest from Wrathion that requires you to continue to rep grind til revered which can be done by killing opposing faction npcs in Krasarang Wilds in patch 5.1. The 2 new factions will play a part in your legendary questline. Currently have 7 sigils of power & 2 sigil of wisdom - ALL obtained through LFR. Just finished the quest The Strength of One's Foes and was not sure if i should keep the extra Sigils or not so ticketed a GM, can confirm its safe to delete any extra Sigils you have in your bags. There should have been a Sigil of Courage for this quest, too. The downside of this questline is that you still loot Sigils you already completed. For example, I have looted only 8/10 Sigils of Power and 49/10 Sigils of Wisdom. Contacted a gm about and they mentioned and confirmed that you only need 10, not more. The gm mentioned that they were going to fix this bug in the next patch and that you will no longer be able to recieve Sigils after you've obtained the required amount of Sigils you need to complete this quest. These either have a much better chance to drop than wowhead suggests or the rates changed in 5.3. I just got the quest and have downed 7 bosses and looted 7 sigils, all in LFR. I am either extremely lucky or the rates are very very high. Do these also drop off the ToT bosses as well, or just the MSV, Terrace and HoF? Since 5.3, the Sigils do still drop on Mogu'Shan, Heart of Fear and Terrace, they do still drop in LFR, and the chances are still the same. However, Both sigils can drop in any of those raids, so by now it is actually MORE of a raidgrind than before, seeing as you can't just skip the raid you don't need anymore. The Strength of One's Foes: Players should no longer be receiving excess Sigils of Power or Sigils of Wisdom. Hopefully, we won't end up with 22 wisdom and 8 powers! Does this quest have to be completed to do the Wrathion Legendary quest line? Neglected this all during 5.3. Did LFRs just before 5.4 and in one day got 4 powers and 3 wisdom for a count of 12 and 10. I used to keep them in the bank and got 2 extra powers, but put them all in my bags for 2 LFRS and didn't get extras, but all I needed. So maybe it helps if they're in your bag. But if extras are out in 5.4 then it shouldn't be a problem. Who knows? I didn't see this listed anywhere else in the posts - when you go to turn this in you need the sigils in your inventory, otherwise it's a trip back to the bank. As of 5.4 these drop in Throne of Thunder as well. As of 5.4 running through all of the old LFRs should give you 10 of each Sigils. It is a random drop chance, but it seems to be pretty high - so you will probably have all the sigils you need before you play through all the old LFRs. Here is a breakdown of all steps with short instructions and timing. As of 5.4 this should take anywhere between 8 and 15 weeks to complete. The timing assumes you wait until you're on The Strength of Ones Foes quest before entering any raids, and do every raid available. Alliance:Speak to Brewmaster Tsu or Seer Yong to recieve Mysterious Note, which starts Stranger in a Strange Land. Go see Wrathion in the Tavern in the Mists. Horde:Speak to Kurong Caskhead or Cook Tsu to recieve Mysterious Note, which starts Stranger in a Strange Land. Go see Wrathion in the Tavern in the Mists. A Legend in the Making - share a drink with Wrathion and listen to his story. Trial of the Black Prince - obtain Honoured reputation with The Black Prince, requires a couple of hours of grinding, depending on your spec and gear it can be faster. Most level 90 humanoid mobs and rares provide reputation with The Black Prince. Best place to grind rep is probably Isle of Thunder. The Strength of One's Foes - collect 10xSigil of Power and 10xSigil of Wisdom. They drop in all Pandaria raids on any difficulty. This includes: Mogu'Shan Vaults, Heart of Fear, Terrace of Endless Spring, Throne of Thunder and Siege of Orgrimmar. Should be able to obtain within 1-2 weeks, depending on you luck. Leave Terrace for last, in case you get enough drops in other raids, so that you can complete the next step without having to do it twice. Fear Itself - get a drop from Sha of Fear, the final boss in Terrace of Endless Spring. If you already cleared Terrace during the lockout, you can still come back on LFR and kill Sha of Fear again to get the drop. Breath of the Black Prince - speak to Wrathion and get your first (now pretty useless) reward - a legendary weapon gem with +500 to your primary stat. Can only be used in Sha-Touched weapons from Heart of Fear and Terrace of the Endless Spring raids. The timing assumes you do not obtain any Valor Points in the first week until you're on A Test of Valor quest. A Test of Valor - get 3,000 valor points. Any valor gained prior to picking up this quest does not count. Takes 3 weeks if you haven't got any valor yet the week you get this quest. The Prince's Pursuit - obtain Revered reputation with The Black Prince, requires a couple of hours of grinding, depending on your spec and gear it can be faster. Most level 90 humanoid mobs and rares provide reputation with The Black Prince. Best place to grind rep is probably Isle of Thunder. Alliance:The Lion Roars/Horde:Glory to the Horde - win one PVP match in both Temple of Kotmogu and the Silvershard Mines. Alliance:A Change of Command/Horde:A Change of Command - kill an NPC in Krasarang Wilds, can be done with a group of 2-3 players. Alliance:Call of the Packmaster/Horde:The Soul of the Horde - speak to Wrathion and get your second reward - an extra socket for any weapon. Still pretty useful, but nothing ground-breaking. Timing assumes a weekly clear of Throne of Thunder and Siege of Orgrimmar bosses that drop relevant quest items. Secrets of the First Empire - collect 20xSecrets of the Empire and 40xTrillium Bar. Secrets of the Empire drop off any boss in Throne of Thunder, as well as the first 8 bosses of Siege of Orgrimmar. The raids can be done on any difficulty. My experience on 3 characters, as well as talking to guildies leads me to believe you can expect anywhere between 2-6 Secrets of the Empire per week, assuming a full clear. I Need a Champion - obtain Exalted reputation with The Black Prince, requires a few of hours of grinding, depending on your spec and gear it can be faster. Most level 90 humanoid mobs and rares provide reputation with The Black Prince. Best place to grind rep is probably Isle of Thunder. Spirit of the Storm Lord - use a quest item on Nalak, a world boss on the Isle of Thunder, and stay alive for 10-15 seconds while it channels and charges up. Best done in a raid group. The Crown of Heaven - speak to Wrathion and collect your third reward, a very powerful legendary gem that goes in the meta slot of your head item. You can get extra ones for the price of 5xPrimal Diamond. Echoes of the Titans - collect 12xTitan Runestone. These drop off the last 6 bosses of Throne of Thunder and the first 8 bosses of Siege of Ogrimmar. My experience on 3 characters, as well as talking to guildies leads me to believe you can expect anywhere between 2-3 Titan Runestone per week, assuming you kill all bosses. Lei Shen and Sha of Pride are guaranteed to drop a Titan Runestone every week. Heart of the Thunder King - get a drop from Lei Shen, the final boss in Throne of Thunder. If you already cleared Throne of Thunder during the lockout, you can still come back on LFR and kill Lei Shen again to get the drop. Celestial Blessings - fly around Pandaria and visit the various temples and speak with Celestials. This will take you to Kun'Lai Summit, Townlong Steppes, Jade Forest and Krasarang Wilds. In addition to speaking to the Celestials, you will have to fight Wrathion at one of the temples and complete a role-specific challenge. Cloak of Virtue - Speak to Wrathion to get your next reward, an epic item level 600 cloak. Do not waste your valor upgrading this cloak, as you will be getting your legendary soon which already comes upgraded to item level 608. Timing here assumes getting as far as the cloak, does not include the Garrosh Hellscream kill. Secrets of the Timeless Isle - Collect 5,000 timeless coins. You get coins for almost anything you do on the Timless Isle - killing mobs, looting chests, completing quests and even skinning, herbing and mining. You get a lot of coins from doing the introductory quests on the Isle, and I recommend looking for chests and rares for quick coins. The Emperor's Way - You have to defeat the four Celestials on the Timless Isle. They are all always available to be killed, but only one can be engaged in combat at a time. This is best completed with a full raid. A Pandaren Legend - Speak to Wrathion and get your legendary cloak. The cloak comes upgraded to item level 608. Judgment of the Black Prince - Kill Garrosh Hellscream, the last boss in Seige of Orgrimmar. In case anyone was wondering, yes, these do drop in the Siege of Orgrimmar as well. It does not specify that they do in the quest dialogue, however, because this quest was out before Siege of Orgrimmar was. I'm missing 2 Sigils of Wisdom for the quest, I killed the Sha of Pride (first time of the week, in a Flex raid, hadn't kill it in any other mode), and nothing dropped for me - while some other people did get a Sigil or Runestone or Secret in the raid. And the Sigil wasn't sent by mail either. 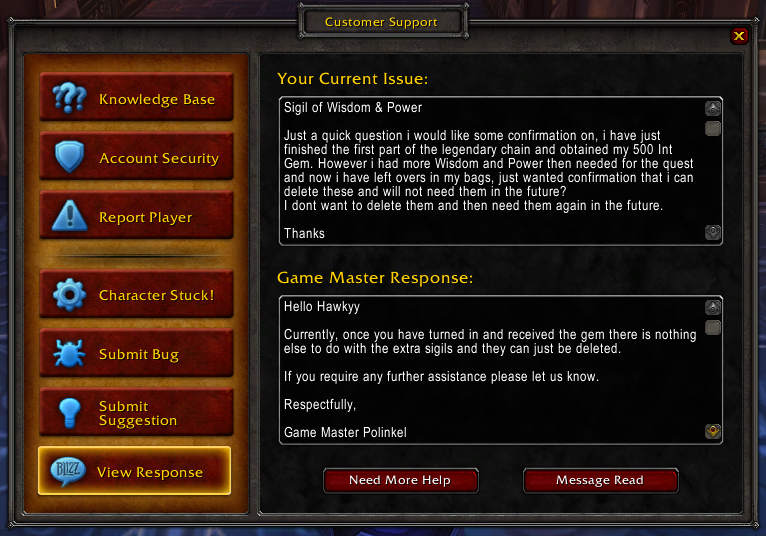 I haven't found any "official" source of this info so I wrote a GM ticket asking if I could get my Sigil of Wisdom. Please note, that the Sha of Pride, only offers a 100% drop chance on the Titan Runestone, not on the Sigils of Wisdom. I had Sigil of Power x10 and Sigil of Wisdom x6, and the next four Sigil's I got were all Wisdom. I think maybe they fixed it so that more than 10 of a particular Sigil can't drop. Can anyone confirm if they are having similar experiences? Theoretically speaking A Test of Valor (gain 3000 valor points) can be done in 7-8 days depending on your timing in the quest line. Pick it up on a Monday evening, knock out 1000 valor, 1000 the next week, then 1000 following that week. It doesn't strictly take 3 weeks....theoretically of course. On a side note, if you picked up the quest after killing the raid bosses, killing them again (during the same lockout) does not grant a sigil. Weird thing I noticed this week on an alt: I did 6/8 bosses in first 2 wings in SoO and got some sigils, then couple days later (same week) I did flex 1+2, and got sigils from 2 bosses there too. which I had already killed in lfr. Last time I knew, you had only 1 loot chance per week per boss regardless of difficulty, so... this didn't make sense to me. These now also drop in Siege of Orgrimmar so don't follow the tooltip to be 100% correct. Well I'm a little stuck and could use some help. I run multiple toons like so many of you, and I can't really keep up with all of the quests completed or not. On the toon I need help with, I have the quest: Trial of the Black Prince, but the quest: The Strength of One's Foes is not available. I have a Shamy that currently has both quests active in it's log. I'm thinking I missed a quest, though since I have TotBP means I finished quest: Stranger in a Strange Land. Any ideas would be great! Thanks for taking the time to read this. onward we go, just passed one foe's part now for valor.. Collect 10 Sigils of Power and 10 Sigils of Wisdom from raid bosses in the Mogu'shan Vaults, Heart of Fear, or Terrace of Endless Spring. Great leadership requires the power to shape the destiny of your people, and the wisdom to make the right decisions. Pandaria boasts great power and ancient wisdom, but rarely in the same place. Let's see if you and I can change that! Acquire sigils of power and wisdom from fallen foes in the Mogu'shan Vaults, the Heart of Fear, or the Terrace of Endless Spring. We will put them to a much better use than their current owners. Sigils of wisdom will often be found on practitioners of the arcane arts, while sigils of power are usually found on those who favor brute strength. This is not always true, but it may help you find what you need. My friend - you do not disappoint! We will put these to good use.